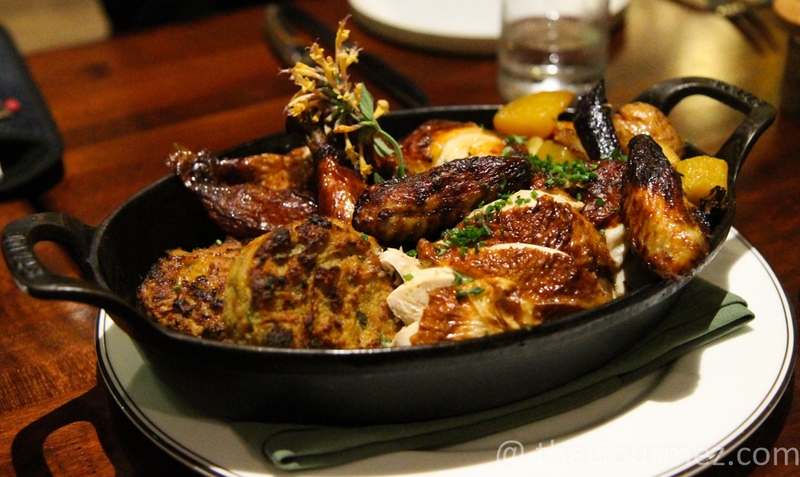 Obligatory disclaimer: My Urban Tavern meal, reviewed in this post, was entirely free to me. 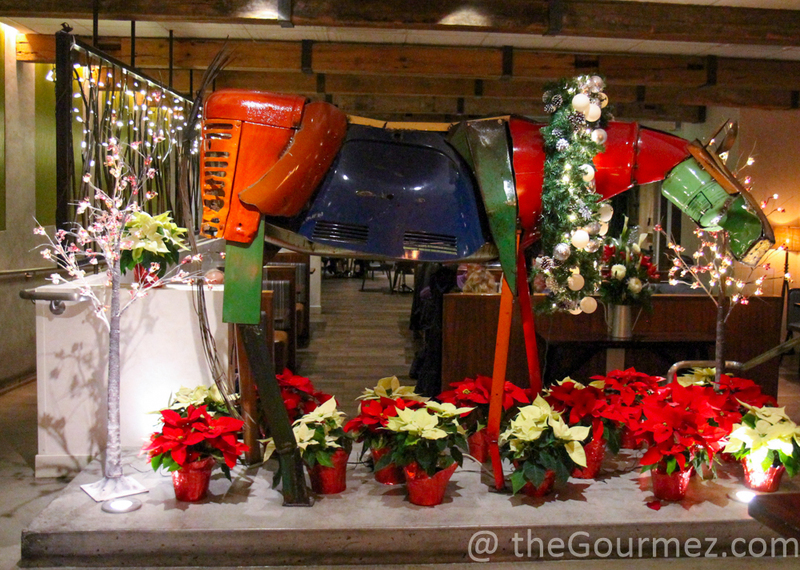 The restaurant’s central showpiece at Christmastime: a colorful, metallic horse. 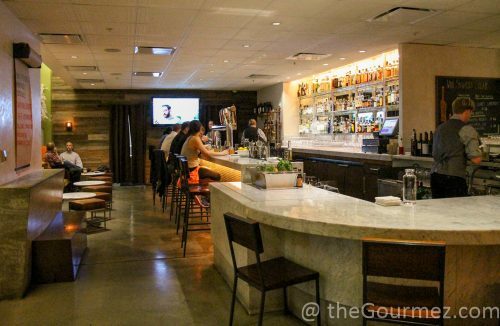 When I visited the Cityscape Lounge last fall, high up on the 46th floor of the Union Square Hilton, Executive Chef Michael Vaughn was still working on the vision for remodeling the hotel’s ground floor restaurant, Urban Tavern. But he was full of excitement for the project, describing it as the next stage in the evolution of the gastro pub. As of December, and with Chef Michael Raub heading up this branch of the Hilton’s culinary program, that vision has been realized. Step in from the street, and you’ll find an attractive bar of marble. Tile and wood tie in other natural materials. That aesthetic can also be seen in the metallic reed border in the dining room itself, bringing in a bit of greenery, at least in spirit, to this escape from the city outside. 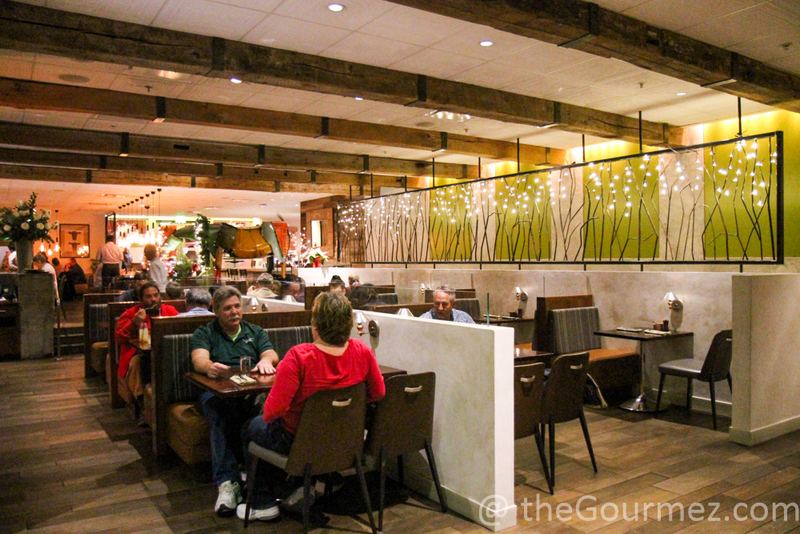 If you come in through the hotel lobby, the dining room is where you’ll enter, so make sure to cross through it to the host table by the bar. 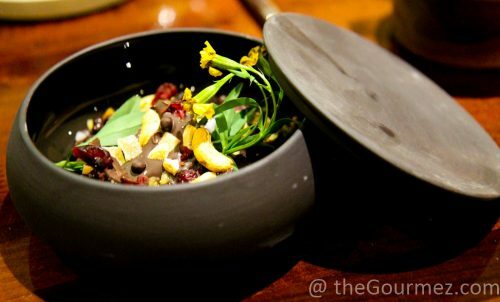 Whatever route taken, be prepared for a feast for the eyes, the stomach, and the imagination. Don’t believe me? Why, I have a case for you! 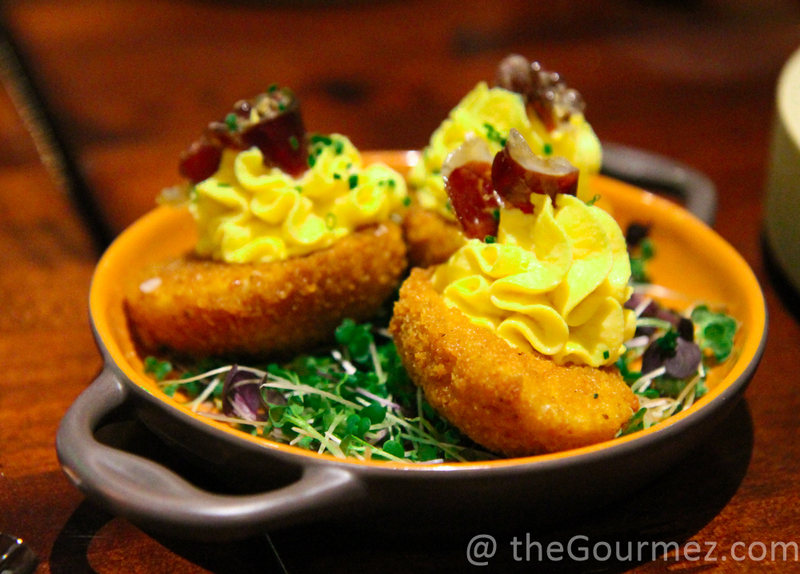 Evidence #1: Deep-fried deviled eggs! What?! The hard-boiled egg whites are battered and deep fried, filled with the whipped egg yolks and bacon, then topped with white balsamic balls. What a fun way to liven up this old standard! The crunchy bacon added textural contrast. Evidence #2: Buffalo wings in a way you’ve never seen. This was for sure a highlight of the meal, in large part because of the exceptionally lively fresno chile sauce that paired remarkably well with the pickled veggies, which of course included carrots and celery leaves. 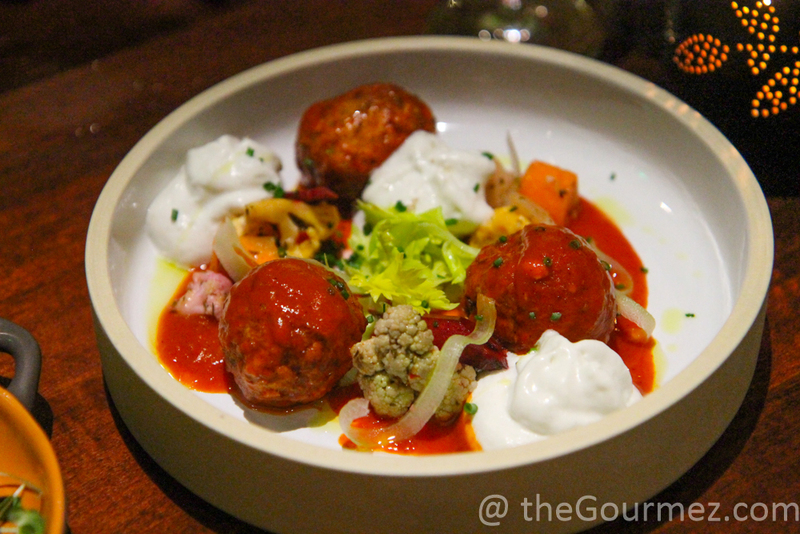 Piles of blue cheese foam and chicken meatballs completed the dish. Oh sure, you might argue the meatballs should star, rather than complete, but you haven’t tasted that sauce yet. 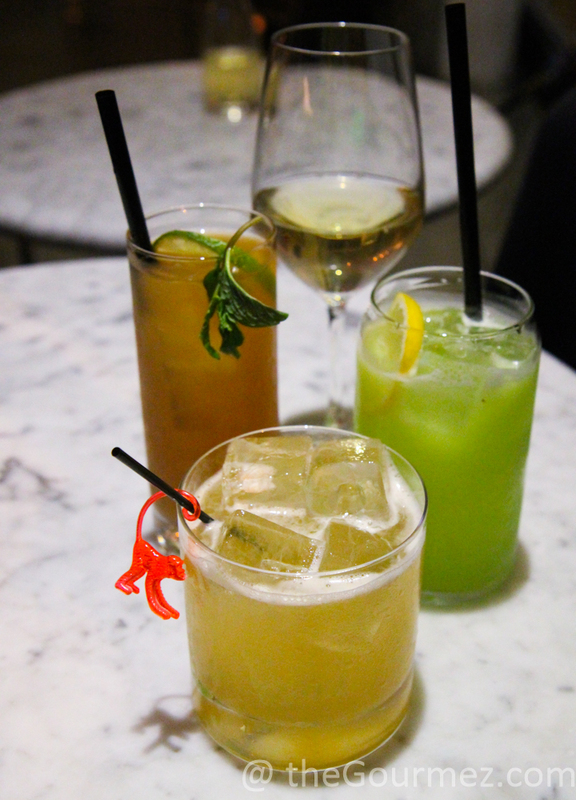 Evidence #3: The Year of the Monkey cocktail. Urban Tavern has plenty of fun cocktails to partake in, but the Year of the Monkey topped my list. With apricot liqueur and apricot preserves, you might fear too much sweetness for a proper whiskey drink, but the result is a surprisingly light-bodied beverage. The Jameson Black Barrel strikes a beautiful balance with the sugar content. Lack of Evidence: A salad with no room for maneuvering. While nicely presented, the serving bowl undid this salad’s potential. When a salad must be cut to be eaten, like this one, a knife must fit in there somewhere. That was a Mission Impossible, or at least Improbable, in this case. 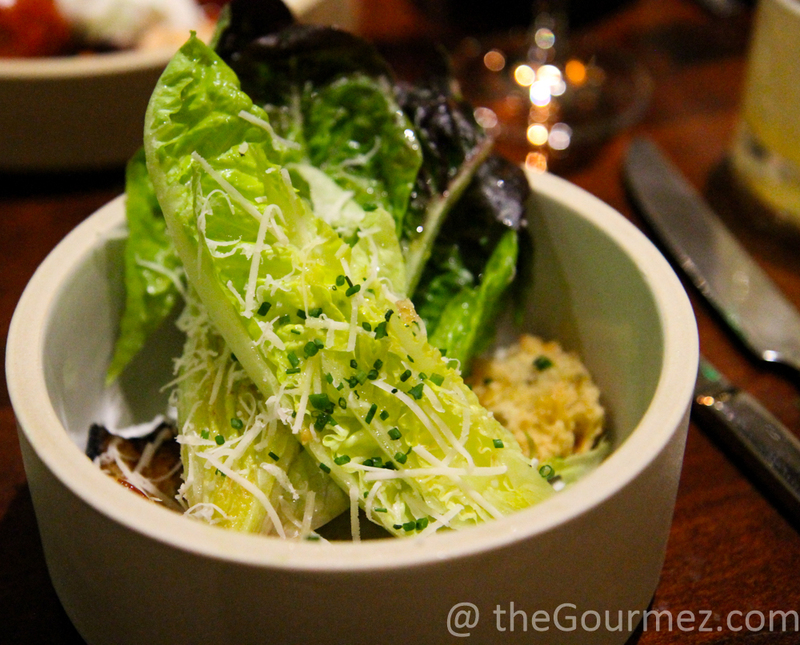 The croutons were also too hard, but the Dijon herb vinaigrette was delightful — when I could get down to it. 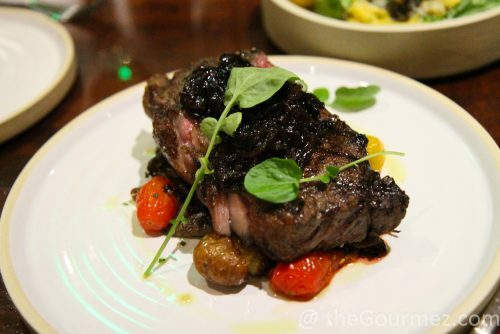 Evidence #4: Steak that makes me salivate. Most of my readers will be aware by now that I rarely order a slap of beef to cut into for myself, but this is one I’d consider. The balsamic onion marmalade served with it is phenomenal, and Chef Raub’s team shows that oh-so-important basic skill that many cooks never master: applying the perfect amount of salt and pepper. The blistered tomatoes added a warm gush of brightness. Evidence #5: Saucy sole with a crust. 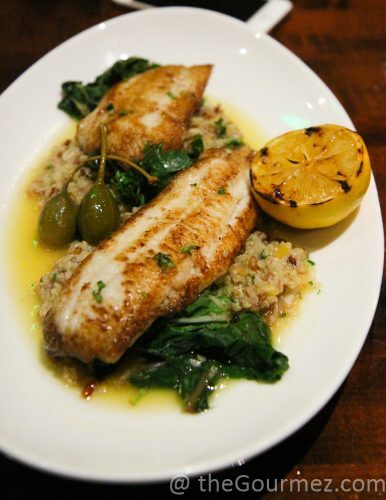 Fish can be so difficult to get right, and Urban Tavern did it by bringing in extra moisture from the accompanying sauce while maintaining a golden char on the sole itself. The side dishes were tasty, and the butter soaked in everywhere it should without pulling focus. Evidence #6: Chicken cooked under a wine bottle. This will be Urban Tavern’s signature dish, I have no doubt. The presentation is great, and that unique roasting technique yields wonderfully cooked meat. Lots of flavor came with the equally well-roasted potatoes and purple carrots, but, fair warning, the stuffing cakes are on the dry side. Evidence #7: Sweets that tickle the senses. Feeling creative, Chef Raub came up with his hippie bark the night of our media dinner. It’s the sort of unexpected treat you might find appearing on your table unasked for, if the mood strikes him. The hippie bark was a playful conglomeration of trail mix ingredients melded with chocolate. 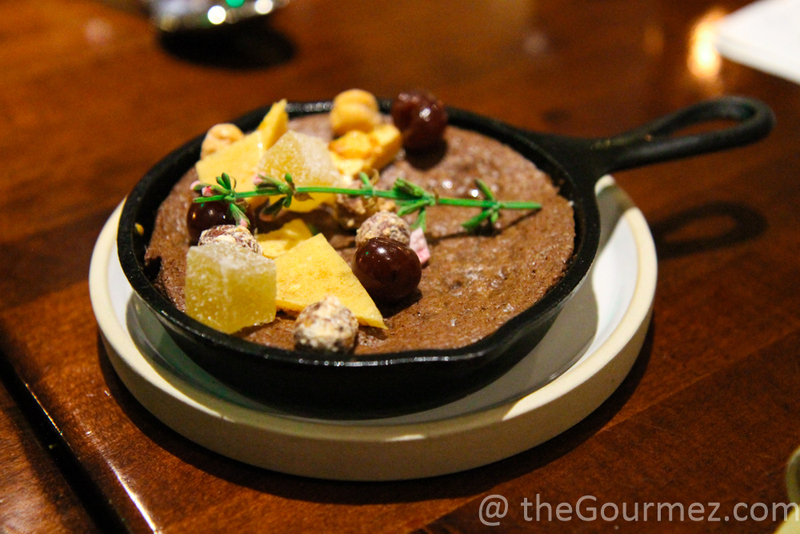 Our second dessert — a sea salt, skillet brownie made with TCHO chocolate — was served with brandied cherries, ginger, and honeycomb meringue cookies. It’s all the soothing satisfaction you think it’s going to be. There’s also a citrus panna cotta on the menu that fruit fans will love. Have I made my case? If you need further convincing, let Chef Raub’s obvious enthusiasm for buying local sway you. He relished speaking of his relationships with his producers and shared his love for witnessing what such fresh, well-tended ingredients spark in his patrons — often a sense of nostalgia and feeling of wholesomeness. That’s likely part of what made him the right chef for the job, as Executive Chef Vaughn considers sustainability in every aspect of the Hilton’s culinary program with an ultimate goal of zero food waste and leaving as small of an environmental footprint as possible for the largest hotel on the West Coast. While you deliberate, I’m going to slip on out and see if I can scrounge up some more of that hippie bark. I’ve already arrived at my verdict. This media dinner took place 15 December 2016.